Have too much stuff, don't use self-storage, get rid of it. Can’t store your stuff, then you have too much. I was contacted a while back by a copywriter. They kindly offered to write me a guest blog post, all they asked in return, was a link to their client’s website. Not unusual in itself, but their client was a self-storage company. Clearly they didn’t quite get what Minimalism is about, but it did get me thinking. In the UK, the growth of self-storage companies is ‘astounding’, they are popping up everywhere. Why is this ? According to one report I read, they said, “In general, people are acquiring more possessions”. In another, they said that we’re downsizing our homes as we get older, but we don’t downsize our possessions and have to store them elsewhere. Hang on, so we have too much stuff, we can’t fit it in our homes, and then we pay to store it somewhere where we rarely see it. Isn’t that a bit silly ? … It is often bound up with a value system which regards social status as being determined by affluence as well as the perception that happiness can be increased through buying, spending and accumulating material wealth. Positively, materialism might be considered a pragmatic form of enlightened self-interest based on a prudent understanding of the character of capitalist society. Negatively, it is considered a crass, if not false, value system induced by the spell of commodity fetishism and void of more noble and worthy values. Perception, yes, its perceived that buying, spending and accumulating make you happy. A very real cost if we pay for items, then pay again to store and rarely see them. As we find out, accumulating may well not give long-term happiness, and potentially give rise to long-term cost. Perhaps we should indeed see it for the false value system it is, and definitely spend time on more noble and worthy activities. 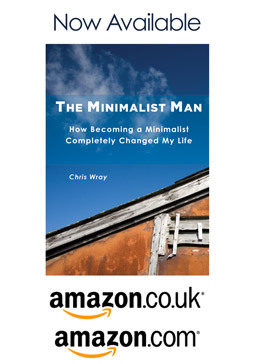 I’m a minimalism practitioner myself. Like faith, there are ups and downs in living the minimalist lifestyle, so I admit I do succumb to consumerism sometimes (but I regret afterwards). Blogs like these help motivate. While I wish I could live out of a bagpack, I have passion for cycling and motorcycle riding that involves gears like helmets, boots etc. Minimalism has helped me leave the unnecessary and live my passion. I am not a nomad kind of minimalist, but I don’t have much of anything else. My friends find me eccentric in such a way. Well, they can wear their designer wardrobe, polish their brass collection, dust their unread books, worry about the sofas and the carpets, play their playstation/xbox…while I am happy out riding.